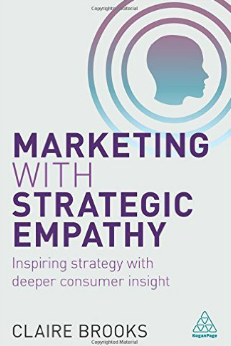 "Marketing with Strategic Empathy: Inspiring Strategy with Deeper Consumer Insight" helps marketers who want to dig deeper into understanding their customer's brain. Using a four-phase process that immerses a business in the customer's world, the book shows why surveys and Big Data only go so far in marketing. The book also details how to use the insights from this four-phase process into a continually adapting competitive strategy. In their quest to find out what makes customers “tick”, business owners have invested in Big Data, surveys and social media campaigns. The problem with this approach is that it is not enough. Customers are driven by more than what they post on Facebook or what they check off on a survey. That’s where Marketing with Strategic Empathy: Inspiring Strategy with Deeper Consumer Insight steps in. Understanding customers is hard, but an essential part of business. Businesses that “get” their customers make more money quite simply. The problem line is that they are complex, which makes it hard for business owners to know where to invest their marketing dollars or staff. In Marketing with Strategic Empathy, the path out of this complex jungle is to dig deeper into the human, not the data (aka their brain). The problem is that simply asking customers about their preferences doesn’t always help. Customers answering a survey question about their purchase are in a different mode when they actually purchase that product. To provide an example, the book focuses on a J. C. Penney marketing mishap. In an attempt to bring in sales, J. C. Penney decided to focus on technology and get rid of its coupons. Sales dropped heavily as a result. Why? According to the book, the leadership at J. C. Penney tried to make a superficial change without deeply understanding what drove their customer. Customers, particular J.C. Penney’s target customers (moms), liked the coupon aspect of J. C. Penney. They didn’t want a high-tech company with discount prices. They wanted an inexpensive place to shop for their family and find a coupon or discount on something for themselves. Getting to this point where businesses can avoid the mistake that J.C. Penney made is the core focus of the book through something the book calls the “Strategic Empathy Process”, a four-phase project where businesses investigate their customers’ behavior, attitudes, and beliefs and use what they learn to continually update and reorient their marketing position. This book will be of special interest to marketers and business owners who want to refine their marketing. If you have ever wanted to understand your customers at a deeper level, Marketing with Strategic Empathy is definitely a point in the right direction. The book reinforces the idea that customers aren’t just data points or survey responses. They are people with all of the paradoxes that go with it. The book takes this idea one step further and suggests that readers can integrate their customer’s insights into a constantly adapting marketing plan. That can be very helpful news if your business has a specific target audience but can’t seem to lock in on that target audience’s motivations and purchasing behavior.